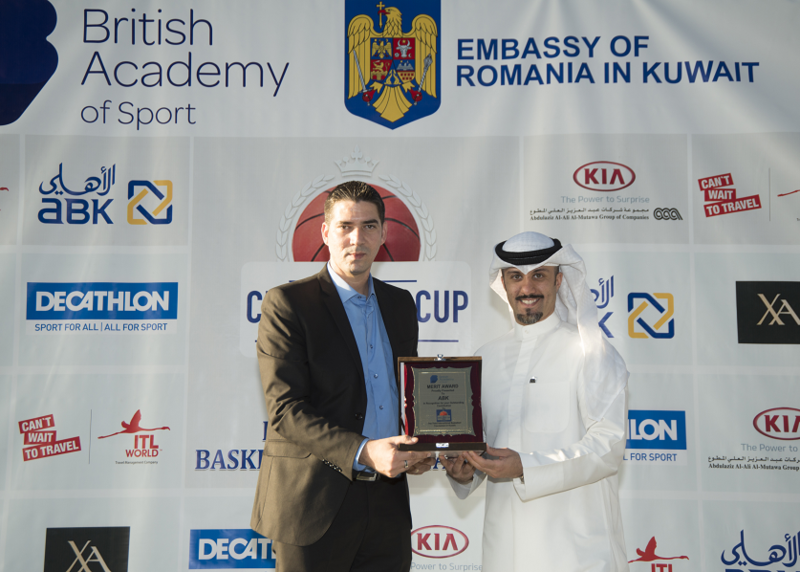 As the gold sponsor, Al Ahli Bank of Kuwait (ABK) has celebrated the success of the International Basketball Tournament, which was organized by the British Academy of Sport (BAS) and the Embassy of Romania on Friday, 25th November at the British School of Kuwait in Salwa. This annual sporting tournament has taken place between embassies in Kuwait since 2014 and is now a regular fixture in Kuwait’s diplomatic sporting calendar. This year the event was more popular than ever before, attracting a record of 12 embassy teams from Czech Republic, Egypt, France, Great Britain, Greece, Indonesia, Jordan, Lebanon, Philippines, Romania, Serbia and USA. Mr. Ali Al Baghli, Senior Manager - Corporate Communications represented ABK at the event, presenting medals, gift bags and the ‘Challenge Cup’ trophy to the winning team from Egypt and accepting a trophy on behalf of ABK to mark the Bank’s sponsorship and support of the community. The event, which is a social occasion for participants and their families and friends, was attended by a crowd of 400, including a number of ambassadors and other senior embassy officials, who all enthusiastically supported their teams. ABK is a long-time major supporter of a wide range of events and activities which help to reinforce and support communal wellbeing in Kuwait.